Berkeley, CA (USA) -- More than 10 guest professors from across the country joined UCLA faculty for a two-day conference on recent scholarship in the study of Buddhist art. << Previously, there had been a strong tendency to isolate the study of Buddhist religious thought and practice from that of Buddhist art. Donald McCallum, host and UCLA art history professor, greeted guests at the UCLA Faculty Center early Friday morning to start off a full day of public lectures held on Nov. 21, 2008.In introductory remarks McCallum recalled a time when scholars in Buddhist religious studies and art history were very separate. "Previously, there had been a strong tendency to isolate the study of Buddhist religious thought and practice from that of Buddhist art, and ordinarily scholars in the two groups did not interact very much." He dedicated the conference to scholars Phyllis Granoff and Koichi Shinohara, both from Yale University and both present at the event, whom he credits with helping to bring scholars from these fields together. "In the symposia that they organized at McMaster University in Canada there was very close collaboration between specialists in Buddhist religion and Buddhist art, and many people, including me, felt that this was to the benefit of the field in general." A recurring theme was the transmission of Buddhist artistic styles across borders and a closer investigation of contrasting styles in different countries. Six speakers presented their research on regions spanning across Asia, touching upon Buddhist sculpture, icons, art, and architecture. UCLA's Robert Brown researched Gupta Period Indian Buddhist sculpture in the fifth and sixth centuries, searching for signs of influence on Buddhist art in China, Sri Lanka and Southeast Asia. Brown sought pieces from each geographic region for comparison. Texts documenting a major stylistic shift in the mid-sixth century in the Northern Qi Dynasty China revealed that "Gupta styles were reaching China almost at the same time they were created in India," said Brown. 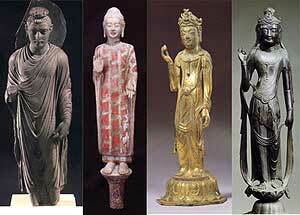 Two examples from Southeast Asia found in what is presently Thailand matched the examples found in India and China stylistically. Brown hopes his findings will help determine where changes in seventh and eighth century Chinese and Southeast Asian art originated by suggesting they can be traced back directly to Gupta Period Indian art in the sixth century. Nancy Steinhardt, University of Pennsylvania, investigated Buddhist architecture, focusing on the pagoda in China, Japan and Korea during the sixth century. Due to a lack of surviving Chinese wooden buildings from the sixth century, scholars turn to Japanese architecture to "fill in gaps." Not only does Japan boast the 20 oldest wooden structures in Asia, but they are also Buddhist. However, Steinhardt believes this approach is problematic and says that, after a series of excavations in the past decade, "it is a new world of research in Chinese architecture." The lectures continued with Cynthea Bogel, University of Washington, who spoke on "Abisekha Halls and Imported Chinese Icons in Ninth-Century Japan," followed by three more country-specific topics. Sonya Lee, USC, spoke on "Death of the Buddha in Pictorial Narratives from Medieval China," Donald McCallum discussed "The Sui Styles in Silla Korea and Hakuho Japan" and Sherry Fowler, University of Kansas, addressed Japanese Buddhist sculptures of Kannon at Tomyoji. Minku Kim, UCLA, "Mortuary Figurines and Archaic Inscriptions: New Perspectives on Buddhist Visual Culture in Third-Century China"
Sunkyung Kim, USC, "Resistance or Compromise? : Two Buddhist Stelae of Unified Silla Korea"
Chari Pradel, Cal State Pomona, "Icons and Rituals at the Kondô of Hôryûji"
Melody Rod-Ari, UCLA, "Wat Phra Kaeow and the Sacred Landscape of Theravad Buddhism"
Akira Shimada, SUNY, New Paltz, "The Invention of the Andhran-style Buddha: An Approach Based on the Amaravati Railing Sculpture"
Yoko Shirai, USC, "Rediscovering the wooden Vairocana icon attributed to Unkei's workshop"
Yui Suzuki, University of Maryland, "Resurrecting the Buddha: Ruminations on Saicho's Personal Icon of Worship"
The event was sponsored by the Paul I. and Hisako Terasaki Center for Japanese Studies, Center for Buddhist Studies, Center for Chinese Studies, Center for Korean Studies, and Center for Southeast Asian Studies.